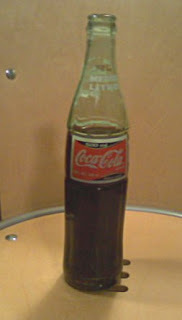 wonderingfellow: Mexican Coke - Not what you think! Mexican Coke - Not what you think! I took the family to Central Market today. Its basically a grocery store, but its a destination grocery store! The fruit's organic, the meat's organic, the cheese, the bread - all organic and slightly more expensive. They had a live band playing in the cafe, chefs cooking over open ovens, and fast paced lively music playing over the speakers. How strange to think that we're paying $4 a gallon for gas and we're going to amusement park supermarkets. Another post for another time I guess! We didn't buy much there but I did buy two bottles of Mexican Coca-Cola. "Why?" - you might ask. Well Coke made in Mexico still is made with cane sugar and not corn syrup. It's not a huge difference but it does make some difference in the taste. Most soft drink bottlers switched from cane sugar to corn syrup in 1984 so the soft drinks that I grew up drinking as a kid contained cane sugar and buying these Cokes today and drinking them takes me back to that time in my life when soft drinks were still in bottles and contained enough of the right stuff to make you burp out of your nose if you drank to fast! Of course drinking such things has helped me develop other bad eating habits, but as a kid it didn't matter that much. I think of the days of being a kid and just living to play, drinking soft drinks, getting pocket change for bubble gum and trying to find a someone who had a go cart (and would let you ride it). Nothing mattered but having fun. Sometimes I'm like that today, just so ready to have fun. That kind of short lived go cart riding, bubble gum chewing, burping out of your nose - fun. And I think sometimes I feel guilty for wanting to do so. I think I need to be so serious and need to get on with the "adult" things in life, but the truth is no adult can keep that up forever. We were made to laugh! We were made to live life to the fullest and not to make every moment about the next task that we'll accomplish or the next big step that we'll take. So here's to Mexican Coke - May I drink it so fast that I burp out my nose! So, did you burp out your nose? Billy likes to buy the Mexican brand pineapple- and mandarin orange-flavored drinks, as he prefers the cane sugar taste, too. I just watched your video and read your wandering thoughts. I loved it! It was good to see you but even better to read your information on Mexican coke. I see that you are still "Sid" in all your glory. I have decided that if I am blue, sad, mad, or ornery I am going to read your stories to pull me up from the pits. You are the best and I have such fond memories of you at my house. I do wish the best for you and your family. You have been in Texas for quite some time now so how is the Job and School thing going? Do you have any working brain cells left? I know this has to be hard and I certainly will add you to my prayer time. I am one of those people that is also not surprised that you are in seminary. God has given you such wonderful gifts to bless others with. Please tell Stacy hello....just think in a few years she will be getting her "PHT" degree (Puttin' Hubby Through). God bless all of you.